All eyes are on today’s announcement of the Signature Dish Awards, representing the finest of Vancouver’s Chinese and Taiwanese cuisine. Stepping into the 11th year, Chinese Restaurant Awards begin a new, adventurous chapter in discovering, recognizing, and supporting Chinese and Taiwanese dining scenes in Vancouver. Celebrated by locals and visitors, the Awards serve as the ultimate guide for culinary excellence and aims to take endeavours in creating impeccable dining experiences. The just announced DINING by the Awards is a series of four stellar dining events that features the creative genius of “East and West” culinary masters, which will take place in May and June. For years, Chinese Restaurant Awards have been creating opportunities for young talents to carry on the legacies of Chinese and Taiwanese cuisine in Vancouver. Today, the Awards have teams of culinary students from Vancouver Community College to present the annual Chinese cuisine inspired tasting experience at the award ceremony reception. MasterChef Canada season 5 finalist Eugene Cheng and contestant Michael Varga have also joined and presented the tasting of fresh BC geoduck. Exclusively for this year, Lifetime Achievement Award goes to Chinese Master Chef Leung Yiu Tong and Hoi Tong Chinese Seafood Restaurant. At age 83, legendary Cantonese cuisine master Chef Leung Yiu Tong has just officially retired in February and closed his Hoi Tong Chinese Seafood Restaurant. The Awards pay homage and salute, once again, to his tireless effort in cultivating the most authentic and original Cantonese flavours and creating countless memorable dining experiences in the past 72 years. 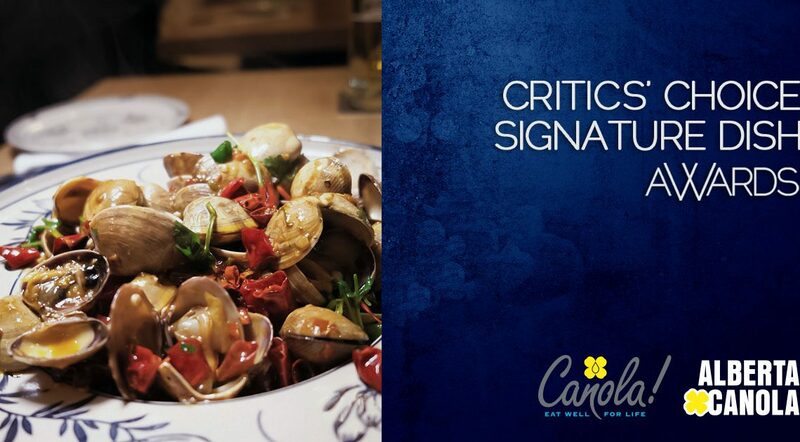 Ocean Wise Sustainable Seafood Award acknowledges Chinese restaurants with a vision of focusing Ocean Wise certified seafood options on their menus and promoting the use of sustainable seafood to ensure the longevity of our oceans for generations to come. This year’s award recipients, YuShang Hot Pot in Vancouver and Vitality Steam Seafood Restaurant in Richmond, have become new partners of Ocean Wise. Presented by Alberta Canola Growers, the Critics’ Choice Signature Dish Awards were judged by acclaimed local food critics Alexandra Gill, Brendon Mathews, Lee Man, and William Ho Wood Kuen. The judges began their tasting journey in September 2018 and had the mission-driven adventure to explore more eateries and recommend must-try dishes for the Awards’ consideration. The growing number of Chinese restaurants in Vancouver and the rising vibrancy of regional cuisines have made the judges’ tasting journey to be challenging, yet exciting. To celebrate the 11th annual Awards, they have found 11 signature dishes from various Chinese regional cuisines, which succeed in the criteria of embodying an outstanding and memorable taste, while living up to the global recognition of Vancouver’s Chinese and Taiwanese cuisine. The seven first-time recipients of the Chinese Restaurant Awards are Happy Valley Seafood Restaurant on Lougheed Hwy, Li’s China Grill on Kingsway, Lougheed Wonton Restaurant in Port Moody, Mama’s Dumpling in Steveston, Mui Kee Chicken Pot and The Fish Man on Richmond’s renowned Eat street – Alexandra Road, and Western Lake Chinese Seafood Restaurant on Victoria Drive. Earlier this afternoon, the 11th Chinese Restaurant Awards ceremony was held at the River Rock Show Theatre. CityTV Breakfast Television’s Thor Diakow and Fairchild Media’s Mary Lo were the masters of ceremony. Over 250 restauranteurs, industry leaders, winners, and media representatives gathered and awaited the announcement of the winners of the Special Awards of the Year, Critics’ Choice Signature Dish Awards, and the presentation of the previously announced Diners’ Choice Awards. Please see enclosed for the list of winners. The Chinese Restaurant Awards wish to thank the following partners: Gryphon Development, Alberta Canola Growers, China Eastern Airlines, River Rock Casino Resort, Underwater Harvesters Association, Oceanwise, Twiisted Media, Fantuan Takeout and Technology Support, Singtao Daily, Pure Luxury Magazine, A Bite of Vancouver, City365.com and Vanpeople.com.